The key to using innovation grants and research and development (R&D) tax credits together is careful planning. They are not mutually exclusive but their relationship can be complicated. So, getting an expert on your side is the best way to optimise your future position. If you are a fast-growing, innovative business, you need as much cash as possible to propel your projects forward. You might have applied for, or will be in receipt of, grant funding to help finance your research and development. A common misconception is that grants and R&D tax credits cannot be used together. If you’re grant funded and looking for additional sources of funding you should, without exception, consider R&D tax credits. R&D tax credits can help you grow without diluting your equity. The rest of this article will explain the relationship between these two sources of funding, and how grants and R&D tax credits can work together to best effect. So, we have put forward two ways of funding innovation: grants and R&D tax credits. Let’s look at these in a little more detail. One important distinction between the two is the timing around when you will receive a cash boost. Whereas grants tend to be up-front funding for which you have to pitch, R&D tax credits are a retrospective tax incentive that you claim after having begun your research and development. At the start of your R&D, and in your first year of trading, this could lead you to favour grants. However, this distinction fades away if you take a holistic planning approach which factors in the impact of R&D tax credits over a few years. This practice creates a virtuous circle – with last year’s tax credit part-funding the coming year’s innovation and so on. The key word is ‘planning’. This is because you certainly can use the two products together. But to get the most out of this as a dual benefit, the application or claim process for each need to be handled carefully. Grants normally come first. The type of grant you apply for and the wording of the agreement, could sheer tens of thousands of pounds off an R&D tax credit claim. It’s worth getting the detail here absolutely correct. The complication largely comes from EU rules to do with state aid and competition. If it is deemed that a company would gain an unfair advantage within the single market, European rules limit the level of state aid that they can receive. Many types of grant and the SME R&D tax credit scheme (the more generous of the two UK R&D tax credits schemes) are considered to be state aid. Crucially though, the research and development expenditure credit (RDEC) is not considered state aid. And this is where you can often find a way forward that means you can make use of both types of funding. As we have covered, government grants and EU grants tend to be awarded to encourage innovation, and innovation is the context in which we are looking at grants here. Collaborative research with other businesses or institutions. Grants can range between £25,000 and £10 million. These will often be technology grants but other types of development grant are given as long as innovation is taking place. In many circumstances, these will be considered state aid. There are some types of government grant which are not considered state aid as they are below a de minimis threshold: these are known as de minimis grants. The EU themselves distribute innovation grants for business under their Horizon 2020 scheme – with a budget of €80 billion – and the older FP7 and FP6 schemes. As these are not sourced from member states they are not considered state aid, but will still affect an R&D tax credit claim. Let’s now turn our attention to R&D tax credits for a moment. What are they? Who is eligible? How much are they worth? There are two schemes; nominally, one for SMEs, and one for large companies. The SME R&D tax credit scheme has a more generous rate of tax credit – up to 33p for every £1 spent on R&D. The rate of the large scheme – the research and development expenditure credit (RDEC) – is about 10p for every £1 spent on R&D. Because of the generosity of the SME R&D tax credit scheme, it is considered notifiable state aid. This means its use may be restricted where a company has received a grant. But the restriction of R&D tax credits is not complete. Depending on the detail of the grant, the SME R&D tax credit scheme may be able to be used to a limited extent, and in any event RDEC can still be used – it’s still an R&D tax credit, albeit at a lower rate. Non-project specific state aid (where a grant is not ring-fenced for specific activity). Project specific state aid (including Innovate UK and GBER funding). Grants limited in size, known as de minimis funding (not considered state aid). We have already covered that we have two high-level types of grant: those that are considered state aid and those that aren’t. And also that the specific activities and costs detailed in the grant documentation can affect the interaction between grant funding and R&D tax credits. We have also established that there are two R&D tax incentives in the UK. These are nominally referred to as the SME R&D tax credit scheme – which is state aid – and RDEC – which is not. Now we will explore the specific ways in which grants and R&D tax credits interact. A non-project-specific state aid grant is one which has been awarded to a company with no ring-fencing as to which R&D projects it can be used for. That freedom might sound useful from a flexibility perspective, but it will lead to a worst-case scenario in terms of using R&D tax credits. The effect of a non-project-specific grant is usually that all R&D carried out by a company must be considered under the RDEC scheme for R&D tax credit purposes. Note that this does not mean that grants and R&D tax credits cannot be used together – just that the lower R&D tax credit rate must be used. 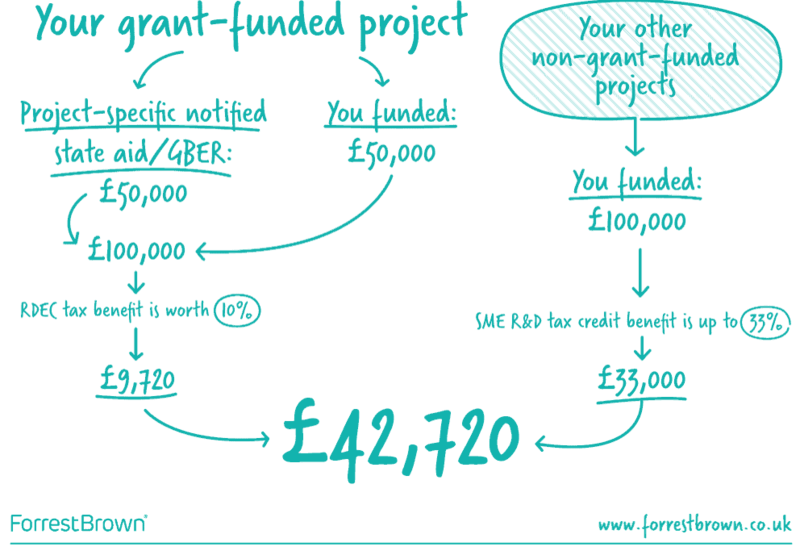 The diagram below shows an example based on £200,000 of R&D expenditure, with a £50,000 non-project specific notified state aid grant. While the R&D tax credit is drastically reduced, it is still worth £20,000 – this money could go towards hiring additional resource for your next project. Having got the worst-case scenario out of the way – and noting that there can still be considerable value in pursuing an R&D tax credit claim in unfavourable circumstances, let’s examine a better scenario. This time, you receive a notified state aid grant, but it is allocated to one specific project. You are carrying out R&D on other projects too. Innovate UK grants are among the most common innovation grants we see. Some people still refer to them as smart grants, even though they were superseded in 2016. As these are not sourced from European money, it is likely they will be treated as notifiable state aid unless special care is taken when negotiating the grant agreement. To take the opportunity to define another piece of relevant terminology, we will say that this grant is covered by GBER – that stands for General Block Exemption Regulations. GBER is something that is used to ease the administrative burden of notifying state aid and would be written into the grant documentation. It does not, however, mean that the grant is exempt from the state aid rules. In our next example, we see another total R&D spend of £200,000 and a £50,000 grant. This time though, the grant is project-specific. The effect of this is that only this project is considered under the RDEC scheme, yielding a 10% R&D tax credit rate. This means the remaining projects can be considered under the SME R&D tax credit scheme – worth up to 33%. The result on the overall financial benefit of the R&D tax credit is dramatic. In addition to the £50,000 grant, this company will receive an R&D tax credit worth £43,000 – more than double the value of our previous example. We are starting to see that a strategic approach to innovation funding will pay dividends, but things can get even better. In our final example, we will explore the best-case scenario for grant funding and R&D tax credits. The key to maximising your innovation funding is to seek a grant that is not classified as notified state aid. De minimis state aid does not have to be reported to the EU. If a company receives less than €200,000 across a three-year period, their grants can qualify as de minimis aid. This is a very good outcome for claiming R&D tax credits in addition to a grant, as we shall demonstrate below. It is essential that the de minimis aid classification is written into the grant documentation. Horizon 2020 is the European Union’s largest innovation and research programme in its history. It has about €80 billion of innovation funding reserved to distribute between 2014 to 2020. The aim is to secure Europe’s global competitiveness by nurturing innovation. Horizon 2020 funding is not considered notified state aid as it is awarded directly from the EU. FP6 and FP7 projects were the predecessors to Horizon 2020 Awards. The EU’s FP6 (Sixth Framework Programme for Research and Technological Development) ran between 2002 to 2006. It was replaced by FP7 (Seventh Framework Programme for Research and Technological Development). This ran between 2007 and 2013 with €50 billion available to distribute. No new money is being awarded under FP6 or FP7, but some companies will still be receiving grants that were agreed under these frameworks. De minimis, H2020, FP6 and FP7 are all treated in the same way when it comes to R&D tax credits, as they are not notified state aids. The grant money itself would be considered under RDEC at a rate of 10%. But they would not prevent the rest of the R&D spend being considered under the SME R&D tax credit scheme at a rate of up to 33%. Here is an example of how de minimis aid, Horizon 2020 or FP6 FP7 grants interact with R&D tax credits. As before, we have a £200,000 overall spend on R&D, £50,000 of which comes from a grant. But because none of these types of grant is considered state aid, the R&D tax credit can be handled advantageously. Only the value of the grant need be treated under RDEC. The rest of the money – even that which was spent on the grant-specific project – can be considered under the SME R&D tax credit scheme. This means £150,000 of the spend will have the tax credit of up to 33%, with just the remaining £50,000 having the RDEC rate of 10% applied. 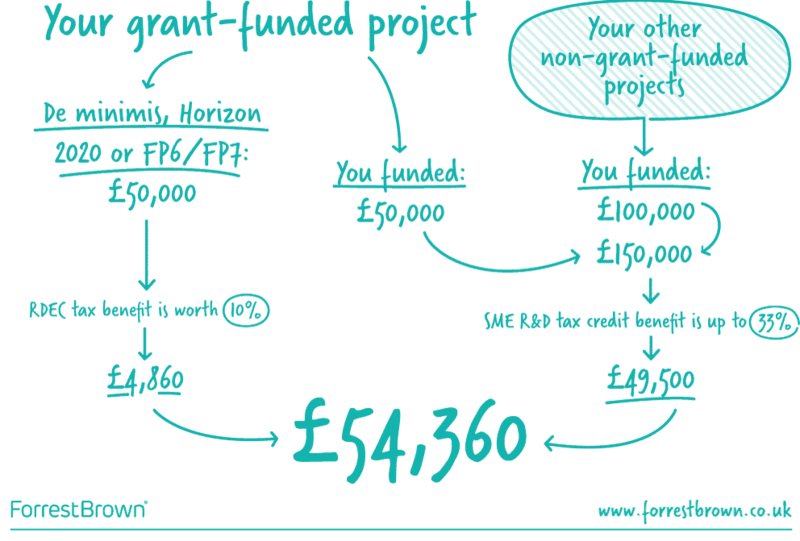 The result is an R&D tax credit worth £54,500 – nearly 10% greater than the original grant – but received in addition to it. For companies looking to maximise their innovation funding, there is clear merit in getting expert advice. You can explore whether you can structure your grants in this way and put together a high-quality R&D tax credit claim. The earlier you do this, the better. our clients have been advised incorrectly that grants and R&D tax credits cannot be used together. a poorly negotiated grant restricts the size of an R&D tax credit unnecessarily. It is important, then, to use an expert adviser. In the innovation cycle, grant applications will often come before R&D tax credit claims. It is before the grant application that we would recommend talking to an expert R&D tax credit adviser at ForrestBrown. This will help ensure you are well informed when negotiating your grant. An expert R&D tax credit adviser will be able to help you navigate the grant application and ensure the grant agreement does not needlessly preclude or limit a future R&D tax credit claim. More than this they will be able to offer strategic advice on how to adapt your business processes to ensure you are eligible for as much innovation funding as possible. By way of summarising what we have covered in this article, we’ll debunk some of the most common myths that surround grants and R&D tax credits. Myth #1 – Grants and R&D tax credits are mutually exclusive. An easy one to start with. As we have shown, the opposite is true. If you are eligible for an innovation grant, it is an indicator that you will also be eligible for R&D tax credits. 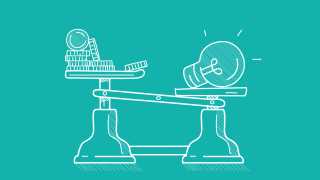 Myth #2 – Grants, no matter how small, will limit my ability to claim R&D tax credits. This is partially true, but not absolute. A grant, no matter how small, could limit an R&D tax credit claim, but with good planning, this may not be the case. Seeking expert advice is important to your future funding position. Myth #3 – If I have received a grant that isn’t ‘de minimis’, I’m limited to claiming R&D tax credits under RDEC. It is more complicated than this. It may be true, but if your grant is project specific or is distributed from the EU, then you are likely to be able to claim some of your R&D tax credit under the more generous SME R&D tax credit scheme. Myth #4 – I don’t understand ‘notified state aid’, but know it’s to do with Europe. So if I’ve received a grant from Europe, then it’s probably state aid. This one is completely wrong. If you receive a grant from the EU (for example Horizon 2020), then by definition it is not state aid. This will simplify the process for claiming R&D tax credits and enhance the value of the R&D tax credit claim. ForrestBrown is a firm of chartered tax advisers specialising in R&D tax credits. Our team of chartered tax advisers, technical specialist and ex-HMRC inspectors provide strategic advice to businesses on how to position themselves to maximise their innovation funding. Our expertise was recognised at the prestigious 2016 Taxation Awards where we won the award for ‘best independent consultancy firm’. In addition, we are experts in submitting high-quality R&D tax credit claims. We have developed a robust methodology that maximises your claim in line with the available evidence to support it. This minimises the risk of you either over-claiming or under-claiming. We also work with our clients to ensure they develop the right processes in their business to get the most from R&D tax credits in future years. 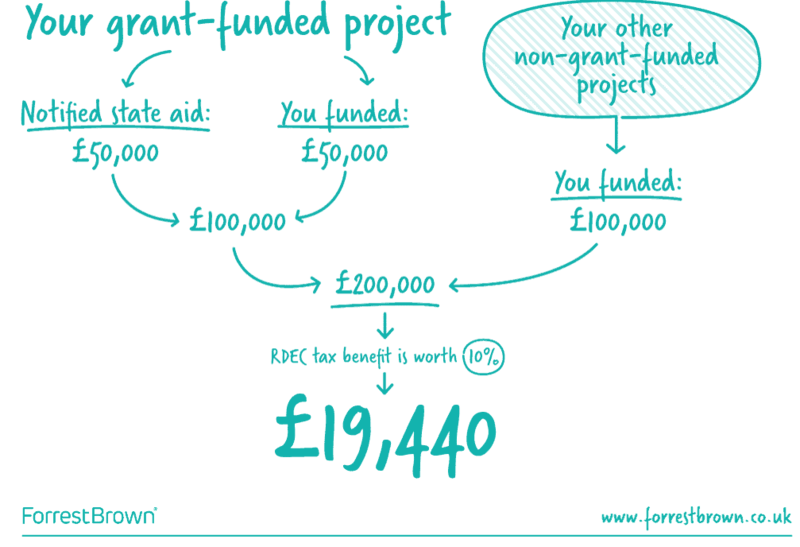 If you have any questions about grant funding and R&D tax credits, please get in touch on 0117 926 9022.